Google's theme parks offices are repeatedly recognized as the best places to work. They have a more grownup playground vibe than actual work space. Because that's how Google does things. 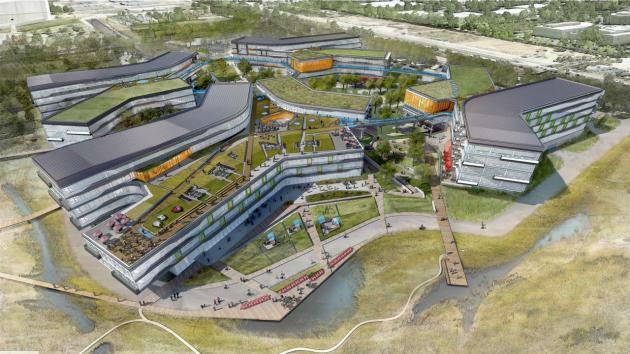 And, according to this new Googleplex rendering, the search giant is ready to go all out for its new 1.1-million-square-foot mini city in Mountain View, California. The new spot, designed by Seattle-based firm NBJJ, looks like an outdoor mall, or luxurious hotel, or both; I'd imagine the finished product will likely be a place you'd want to live, much less work. Google is calling the complex Bay View, and consist of "nine roughly smaller structures, most of which will be four stories high, and all of which are shaped like rectangles that have been bent in the middle," Vanity Fair wrote. Everything will be connected by bridges, with several large and small courtyards arranged around the new campus—all buildings will have green roofs, too. Both eco-friendly and playing off Android's dominant color. As with everything Google does, everything is there for a specific reason: the architecture has been built around an idea of "casual collisions of the work force." "No employee in the 1.1-million-square-foot complex will be more than a two-and-a-half-minute walk from any other," said David Radcliffe, a civil engineer at Google. Google says ideas and innovation can occur at any time, and it wanted to give its employees the opportunity to do so and collaborate everywhere on the campus. The campus will have the usual amenities as well, including cafes and places to stop and shoot pool or play video games. Basically, the ultimate geek wonderland built around tons of data.